I’ve come across many mobile charting applications and to be honest, many of them have failed to live up to my expectations. 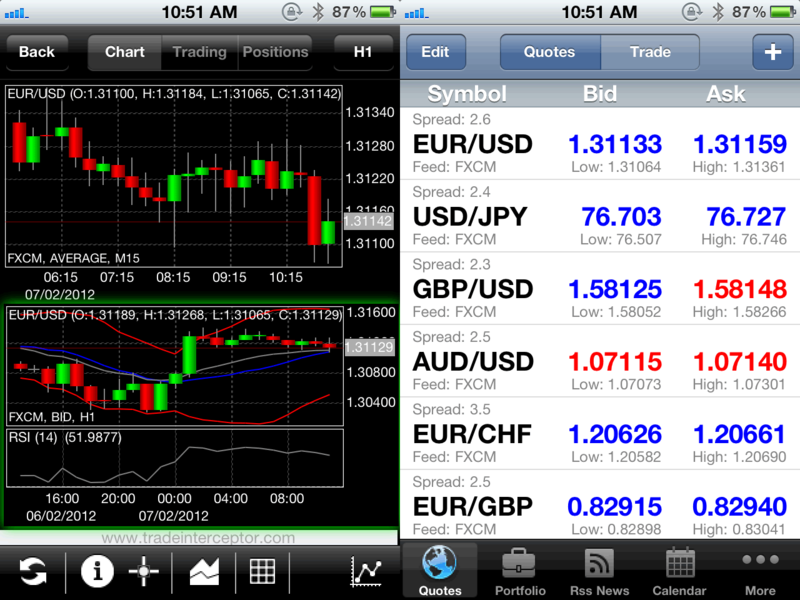 Fortunately, Riflexo has come out with the Trade Interceptor Forex Mobile app and I must say–it’s pretty dang sweet! The charting software is simply, ridiculously amazing (in my opinion), as it allows you to make use of all your favorite indicators. Moving averages, ATRs, Bollinger Bands – you name it, the Trade Interceptor probably has it! The software also allows for multiple charts to be open at the same time, which is convenient for those of you who like to make use of multiple time frame analysis. It also provides RSS feeds for up-to-date forex news, as well as the option to choose which bank to get its price feed from. One of the more unique features is that because it is a third party app, it allows you to trade with different brokers and manage several accounts at once. At the moment, Trade Interceptor’s partner brokers are FXCM, Dukascopy, and ACM Swissquote bank. Finally, a mobile app that can be as deadly as a ninja star and nunchucks! Trade Interceptor is currently available in both the Apple App Store and the Android Market. Can’t stand being away from the BabyPips.com community? Well, the good news is that you can take the community with you wherever you go because the BabyPips.com Forums have gone mobile! 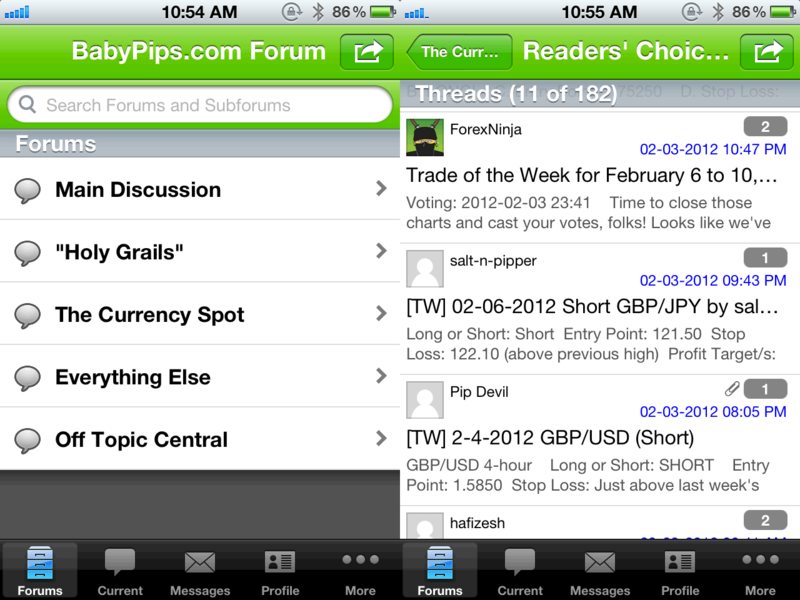 Late in 2011, our in-house developers launched the BabyPips.com Forex Forum app for iOS. You can now start a new thread, add new posts, upload your awesome trade ideas, or just catch up with your forum friends on all the latest forex news and strategies. Pretty neat eh? Download the BabyPips.com Forex Forum app here! Another cool trading app that you may want to download on your mobile device is NetDania. From over 160 currency pairs to major stock indices (Dow Jones, Nikkei, FTSE 100, and DAX) and commodities (precious metals), NetDania has a wide selection of financial instruments that you can trade! In my opinion, there are a couple of features why I think sparing 1.4 MB for this app is totally worth it. One, like Trade Interceptor, it allows you to add technical studies to your charts. You can add from any of the following indicators on your charts: SMA, EMA, double EMA, weighted MA, momentum, ROC and RSI. Secondly, NetDania gives you access to real-time news. And get this! You can choose to be notified when a certain report comes out. So the next time you have a trade open while you’re stuck in crazy Friday traffic, you can just set up a push notification to send you news articles about the NFP report! The good news is that NetDania is available for iOS devices, Androids, and even Blackberrys!